Finally, is the AFK farm ok or not ? All is in the title. I just would like to be sure, because some players say it's ok, and I also see many spots, where a lot of players are farming being AFK (with turrets, minions or pets) but some others say it's against the rules. Therefore, I just wanted to make it clear to me. Thank you in advance for your replies. AFK farming isn't okay, because it tends to lead people to stop playing (both the AFKers and those who see them); it has an economic impact, too, but not as severe. Please report, but not harass, any suspected cases. The main difference between AFK and inattentive farming is that in the first case, you could be in another room, while in the second, you have to be close at hand. [We] do investigate player reports for every issue. Sometimes these investigations can take some time, and we may choose to action in bulk rather than individually. Harassment of any type is NOT OK. If you believe someone is not playing fair, please use the report feature. It not only helps us track the issue, but also helps us identify possible hotspot issues. Even [if the accused] has been ...actioned multiple times for using 3rd party tools, there are better ways to handle this [other than harassment]. [On 7 April 2017] we took action against a number of accounts that were involved in running 3rd party tools to automate gameplay. These “bots” create an unfair game experience for everyone and can cause a toxic atmosphere both in-game and out (as we see in this thread). We will continue to do our best to keep the game fair for everyone. quoter's note: I moved the 'best ways' to the bottom (to be more easily seen) & changed a definite statement about a specific person to be a generic conditional about ANet's policies. The text is otherwise unchanged. The auto-cast feature was never intended to be used as an AFK farming mechanism, and usage of the auto-cast feature while AFK is fine as long as it is not used to facilitate unattended gameplay. Mastery auto-loot also stopping players from being flagged afk seems like a bug instead of a feature, and I’ll be sure to bring it up today while we have a chat about this internally. If all 3 of these apply to what you are doing, you may get actioned for it. I would rather us fix the underlying issue with this rather than band-aid the issue by enforcing rules and punishments that don’t solve the issue at all. The core issue here is we don’t want to have players feeling that their main source of income is generated while they are not at the computer. We have already started to see the impact of this in-game and within the community. Not only does this behavior impact players in the world when they run across a pack of unattended farmers, but also the players who are performing the unattended farming. Eventually these players spend less and less time actually playing the game, and more time unattended farming. We see the same trends in players that use bots, macros and cheats. It eventually leads to players falling out of the game (from both encountering the impact in the world, or by participating themselves). While there is an economic impact of having a large number of players farming like this, I’m more more concerned about behavior trends shifting than anything else. The 3 rules above aren’t just for your protection, they are for everyone’s protection. GMs have been trained to identify and handle these situations, it’s one of the first things they learn. GMs are overly generous on the amount of time that players are given to respond. As for how we intend on fixing that, some of us had a meeting today to talk about that. While there are some systems working against each other here, we all agreed that we didn’t want to make any changes that anyone would actually run into unless they were no longer at their keyboard for an extended period. Rest assured, we aren’t going to take away auto-loot in the world, or remove your ability to auto-cast. Everything we implement will only impact players who aren’t actually performing actions. I’m sure when we do implement something, it’ll be in the patch notes to read about. Until then, follow the 3 rules above. After that, they won’t be relevant anymore. So, if you find bunch of peeps afk farming, then you report them for what? For botting ? Or if you have details (times, dates, screens), you can start a support ticket. In-game issue → Report another player. Afaik, afk farming is NOT ok.
Lazy / not paying much attention farming is...but you have to be at your keyboard. Friend got a three day ban for it and managed to talk to the GM who gave the ban and got told that AFK farming is not okay. So.. I guess it's not okay. AFK farming is not allowed, that is, you must be at your keyboard. Inattentive farming is allowed, for example, you can watch a movie while moving your character occasionally. There are a variety of reasons why you hear different 'rules' from different players, including some players don't like it that ANet allows inattentive farming; they think it's just as inappropriate as AFK farming... and there are others who see no problem with AFK farming on the basis that "it's not that much loot." Regardless, it's ANet's game, so it's up to them to setup the rules, interpret them, and enforce them as they see best for the health of the game. The use of macros to keep yourself logged into the game for gain, is against the rules. IE: If you set a macro to trigger your turrets while you are AFK, that is against the rules. If you manually trigger your turret, and then alt-tab to the forums, or go wash dishes with a timers set so you can come back to trigger then again manually, that is allowed. Good luck enforcing that policy. Passive gameplay using minions, turrets, illusions, pets or autocast on spells is okay. Leaving the game on autopilot without attention is not. The "detection" system for (semi)afk farming is simple. A GM whispers you, if you are there to respond, you are safe. Thanks a lot for all your answers. That's clear to me now. But still, it's almost crazy to see so many players on the afk spots, knowing that's forbidden. You don't know if they are afk. They can be just playing passively. Some of them will be AFK farming, but some will be merely "inattentive". It's hard to tell the difference sometimes. And typically, ANet doesn't suspend people immediately after catching them. They tend to watch people to see if this is a one-time thing, something they do occasionally, or if it's long term. They sometimes want to see if other people follow the same actions (there are in other hotspots) or how they might launder their loot. And unfortunately, regardless of what ANet does, the opportunity to gather loot while sleeping is just always going to be too attractive to some players, especially those who come from games that actually include mechanics that intend to be farmed AFK (e.g. fishing in BDO). So no matter how many people are suspended, there will always be more. Plus, the addition of Free-to-Play makes it easier than ever to restart. There are a variety of reasons why you hear different 'rules' from different players, including some players don't like it that ANet allows inattentive farming; they think it's just as inappropriate as AFK farming... and there are others who see no problem with AFK farming on the basis that "it's not that much loot." I guess that's the hardest part, make the difference between the inattentive farming, and the AFK farming. Actually, to me the afk farming is making the game experience kinda unfair to a player who is behind his keyboard. I dont know if you see what I mean, but I dont find this very fair to have difficulties to make my exploration because of this. That's not a so big deal, at all. But still. It's not just AFK farming that is a problem. I am ALWAYS seeing players teleport in to the vicinity of crafting resources (especially rich mineral nodes) to collect the resource and then instantly disappear. That problem has been around for a long time; has been reported many, many times; the offenders have been reported many, many times; and nothing gets done about it. Because it's a waste of time to report it, I don't bother anymore. "Beware of dragons, for you are crunchy and go well with Ketchup." Sometimes, it's the case, but often times, it's not. There were times when I would go and collect nodes around the map and their same toon would 'blink' around to multiple locations that I happened to be at and passing through. LOL--you say I say--- Tomatoes--doesn't make it right --semantics. can GM's whisper you if you've turned off whispers in your chat? What language would a GM choose to whisper you? Is it reasonable to assume that all players speak english? Regardless, they also do things like move your toon to a different location to see if you notice. do you recognize GMs ingame by something? special names or colours? Most of them when they want to be seen carry a Guild tag of the ArenaNet Emblem(seen at the bottom left of this page) in red(the tag is nothing that a player can duplicate). Their chat is a different color, too. Most likely what you are seeing is an alt char logging in harvesting the node then logging out. Not even close... that takes time. It's the same characters all the time; they pop in, then pop out after harvesting the node. If you want to pretend that's just coincidence, then I have to suggest you're part of that group because NOBODY would believe it "just happens". Passive play is allowed. It's part of game mechanics. Yeah, and if some peoples are having fun by just watch their screen while their turrets/minion are killing adds, it's up to them I guess. But some are out at mall or bar or cutting the lawn or whatever for hrs and even days. that's where reporting comes in and a GM pays a visit to see if the player is passively at the keyboard. Yes, what you describe is AFK-farming. This is not allowed. Learn the difference. The point he is making is that WE have no idea if they are watching TV or at the mall, so it is our job to report possible AFKers and it is the GMs' job to investigate. But which reason should we choose on the list to report AFK players ? Use the "Botting" option. That's what Anet has told us to use when reporting AFK farmers. Actually it's not our job as we are not paid. If pedantry is required, then substitute "onus" as applicable. Regarding, ''101 ways of trying to define passive play''. Don't bother - report them for botting. Then its on them to respond to the GM. That's the acid test. Everything else is academic. "Dudes, are you afk?" "Should I report you?" If they answer, they are ok. If they not, they may be truly not there, and your report would be on stronger grounds. Of course, you are not a GM, so you asking anything doesn't means they HAVE to say anything. You've seen their computers with a weight attached? Not sure why anyone would do that, what with auto-attack and all. Not a computer, but i "farmed" game hours in Super Smash brothers to unlock a character by rubber banding the control sticks together, so it would appear as if i was moving nonstop. If you are afk as in you are not there and will not see when a GM checks on you (be it that he whispers you or moves you to a different place) #3 applies. So jamming a key on your keyboard for your char to attack mobs and then leaving your PC obviously falls in the not ok category. Btw. here is a screenshot I took in ember bay at the most common necro farming spot where I farmed unbound magic and karma just 2 days ago (names, char models and guild tags removed). I was in group with one other who frequently stands there and took the picture after every char there was teleported to a different location one by one. You can see those who didn't notice right away still stand in the water, and there was one more char standing further away on the beach. This is not the first time this happened. 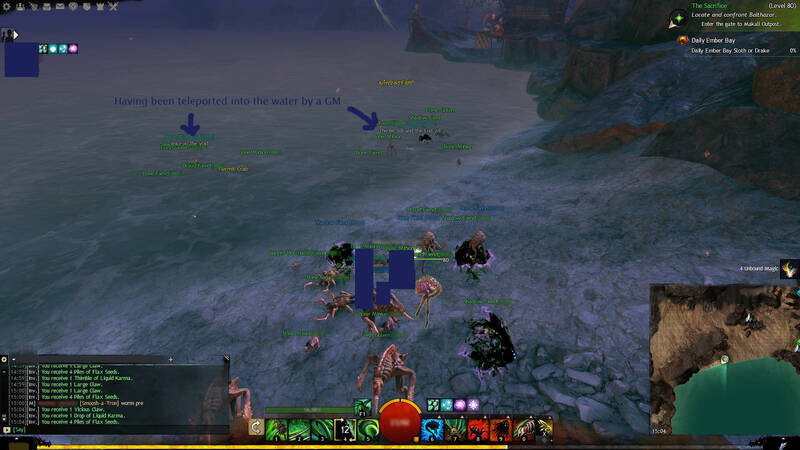 So clearly, ArenaNet is actually doing something and checks if the people standing there are actually afk, or just lazy. You can also see if the char is using any skill once he is ported out of the blob of other chars and pets, and any char who is just standing there without using a skill will be fine even if the player is afk, because #1 does not apply when no skill is being used. "You can also see if the char is using any skill once he is ported out of the blob of other chars and pets, and any char who is just standing there without using a skill will be fine even if the player is afk, because #1 does not apply when no skill is being used." Do you know if Anet has stated why they are teleporting chars to begin with, is it to check if they are responsive or not. I received a 3 month suspension for missing a single dev message in chat scrollback while i was playing the game on minimalized screens, which means smaller interface , i saw my char being teleported real time and i moved my char away from there, minutes later the suspension was in effect. With no previous warnings or suspensions for afk farming. Oh, how I miss Bitterfrost AFK necros keeping the berry nodes clean. That was actually a great tradeoff; these guys get some trivial loot and others can farm berries in peace without being hindered and harassed by those cursed wolves and griffons every five seconds. That is true but I don't understand why you are writing it. All three criteria have to apply for it to be against the rules. If only one criteria would need to apply, everyone using a skill in GW2 would act against the rules as #1 applies to him, or everyone going afk (even in town) would act against the rules as #3 would apply to him. I do not understand what "playing on a minimalized screen" is supposed to be though, and why you saw being moved but did not see being whispered. The interface has only 4 size settings, 2 bigger than normal and 1 smaller than normal. Even with small setting it is impossible to make the interface so small that you would become unable to see a message. -for necros: respawn every minion in same time / same with turrets for engineers. -only using skill 1 even in void without ennemies. Your ways of "spotting" are total nonsense. -Minions do not expire and do not need to be recast unless killed, so they never are "respawned in the same time"
The only halfway accurate indication of someone using a macro or bot is when engi turrets expire and every time are recast with the exact same interval. However, even this "spot" advice is completely pointless because to check this you would have to spend ages watching the engi, and you would not even know which turrets belong to which char. Whisper colours can easily blend it to the others map chat colours or guild chat colours if you are controlling 4 accounts at the same time, running and tagging monsters. Not like anyone playing the game looks at the chat all the time.